Children learn mainly through play so for us it is important that we choose wisely when it comes to picking Eryn-Rose's toys. The all singing all dancing toys are great fun for babies and young children (a headache for parents) but we like to make sure we have a wide variety of toys for both of our children to help them learn through play. I really love wooden toys and puzzle and always remember Jared-David having a big collection of wooden puzzles, blocks and shape sorters. 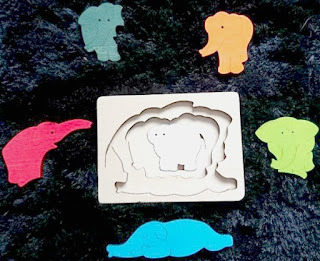 A little while a go we were sent a gorgeous wooden Elephant puzzle from Hape. 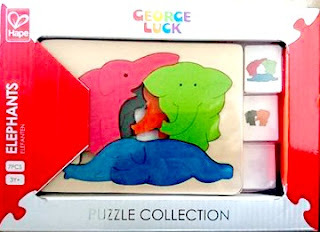 The Elephant puzzle is part of the George Luck range which are a collection of puzzles that are different from your usual puzzle layout. The George Luck puzzle's are cut into single or layers which and use bright and bold colours painted with eco-friendly water based paints. Each puzzle has a theme giving more choice for your children. The Elephant puzzle is smaller than I thought it would be but is still a good size. The packaging is fair and has a picture instructions of how the puzzle fits together. This particular puzzle is recommended for children 3 years and over. Jared-David always get's really giddy when I tell him there is a parcel for him to open, he ripped the package open and immediately wanted to play. The puzzle was easy for Jared to fit together and I think he was a bit disheartened as he does enjoy sitting and tackling a challenging puzzle, I think one of the bigger ones would of suited him better. I always leave him to it an observe from afar watching him play, is there anything sweeter than watching their imagination take over? As I stated he did complete the puzzle rather quickly but he then spent ages playing with the elephant shapes, giving them names and accents and moving them on to the wooden farm. The benefits of this puzzle is it helps with learning how to solve problems by getting the pieces to fit into the correct place. The bright colours help with learning colours as parents can sit down with their child and ask questions such as "what colour is this Elephant?" you can count the pieces with your child and of course you can just leave them to play and enjoy a cuppa while you smile sweetly at them playing. I would recommend this puzzle to any parent who is looking for a lovely gift for their child as the quality is fantastic.